Many of the original number plates on our Austin Sevens were painted letters and numerals on either an attached plate, mainly at the front but also the rear plates of pre 1934 cars, but on the later cars, the Ruby, Pearl and Opal, the number plate was painted directly onto the moulded area on the spare wheel cover. For those of you wishing to recreate this there are legal requirements as to the size and position of the numbers and letters. As it is legal to have non– reflective number plates as long as they meet the requirements of the vehicle when it was first registered you must comply with the following rules. You will see from these rules that cast metal plates were allowed but from my understanding a majority of number plates were of the painted kind, particularly on the cars like the Austin Seven which were aimed at the ‘ordinary man’. The above regulations form part of the Road Traffic Act of 1930 and were still in force during 1942 when the information was published by ‘The Motor’. The regulations stipulate that identification marks on plates are to be fixed at back and front of all vehicles. The painting of the marks on some part of the car at front or rear is not permitted unless the surface be perfectly flat. Each registration plate must be rectangular and bear upon it the index mark of the council with whom the car is registered and the separate number assigned to the car by that council. 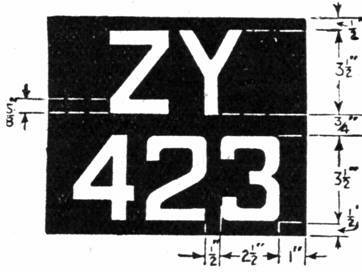 The ground of the plate must be black, the letters and figures being white; all letters and figures must be 3½ ins. high, every part of every letter and figure must be 5/8 in. broad, and the total width of the space taken by every letter or figure, except in the case of the figure 1," must be 2½ ins. The space between adjoining letters and adjoining figures must be ½ in., and there must be a margin between the nearest part of any letter or figure and the top and bottom of the plate of at least ½ in. between the nearest part of any letter or figure and the sides of the plate of at least 1 in. The letters may be arranged in one row with the figures, or the letters may be superimposed on the figures. In the former case, the space between the letters and the figures must be 1½ ins., and in the second case the space between the upper and the lower line must be ¾ in. Cast-metal plates, the numbers, etc., showing as white metal on a black ground. may be used. This article, written by Anon, originally appeared in CA7C Seven Focus in Jan 2001 pp16-17.